This volume covers a broad range of topics in modern geometry and related branches of mathematics, physics and visualization. 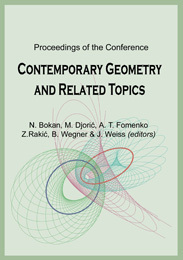 Most of papers give new interesting results in Riemannian and pseudo-Riemannian geometry, various structures on differentiable manifolds, homogenous spaces, submanifolds, Lie algebra cohomology, topology, integrable systems, general relativity, Finsler geometry, geometric invariant theory, links and knots, and noncommutative geometry. There are also papers giving overviews of the recent achievements in some special topics such as Kähler geometry, Minkowski spaces, spectral geometry, quantum groups and Hofer's geometry. This book provides a great chance for interchanging new results and ideas in multidisciplinary studies. Printed by Čigoja Publishing Company.